Edwin William Forster is my Great Grandfather. I’ve attempted to put together a timeline for him using mostly public information such as census, city directories and newspapers. Edwin William was born while his parents were living “Over 501 West Walnut” in Des Moines Iowa. This is the building, which seems to have been 501 to 504 West Walnut, that was built on land given to Helen Margaret Clapp, Aaron Milton Forster’s wife, by her father Edwin Ruthven Clapp. Edwin’s mother Helen Margaret Clapp Forster died in 1879, when Edwin was about 9. Edwin inherited 2/3 of the West Walnut property from Helen and his father Aaron Milton inherited 1/3. Aaron, who was a carpenter and a contractor, built a building on that property which he called “The Forster Block”. In 1883, the Forster Block burns. It was, apparently, re-built and . . . In 1885 Edwin’s grandfather Edwin Ruthven Clapp, sues the Forsters over an easement. They tried to re-build their building a bit bigger and would have blocked some access to E.R. Clapp’s “The Clapp Block”. I think there was no good family feeling here, between the 3 generations. In 1893 at age 23, Edwin marries Loena Iola Koehler. In 1896 that building on West Walnut “The Forster Block” has a “Notice of Sheriff’s sale”. The party suing the Forsters is Hetta Dewey, wife, soon to be widow, of Colonel J. N. Dewey, who is VERY connected politically in Iowa and the U.S. The building was apparently not sold at this time, because it comes up again in 1908 with a notice of Sheriff sale. In 1896, Edwin’s father Aaron Milton re-marries. In 1897, Edwin and Lorena’s first son, Donald Edwin is born. In 1898, quite interestingly, Edwin William’s address is listed as “Feed Barn 222 E 5th”. What’s that about? As often happens, when you learn something, more questions arise. 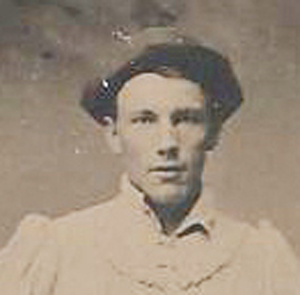 In 1899 he is living at 1302 College Avenue, with an occupation of “Painter”. This must be where the wallpaper connection starts. In 1900 and 1901 he’s still living on College Avenue, with an occupation of “Wallpaper”. There’s a business address listed, also 1302 College Avenue. I guess that he’s still a painter, but specializing in hanging wallpaper. In 1901, his second son, Robert Ruthven (Bob) Forster is born. Robert Ruthven is my Grandfather. In 1903 Edwin is living at 1534 Arlington, with a business address of 607 Forest Ave. That’s the address of his first wallpaper store. So he’s a shopkeeper by then. In 1906, his third son, Milton Charles Forster was born. I’ve attached an advertisement from his store from 1906, which lists the address on Forest Ave. In 1908 “The Forster Block” is again on notice for sale at a “Sheriff’s sale”. The people who are listed as about to lose the property are again Edwin William Forster and Aaron Milton Forster. So they apparently did not lose the building in 1896, at the earlier sale notice. In 1908 the store has moved to 825 Locust. We see it in the city directories at this address in 1909, and 1910. In 1911 we see a bookkeeper and a store clerk listed in the city directory as working at “E.W. Forster”, which was the name of the wallpaper store. So it’s still there on Locust. In 1912, his home address is still 1634 Arlington, but there’s no business address listed. So I believe this confirms the statement of Donald Edwin Forster, ad told by his daughter Dorothy, that the business went bankrupt in 1912. His home is still listed as 1534 Arlington until 1915. So I don’t believe he lost the house right away. In 1915 his business address is 819 7th Street, which we know to be the address of “The Forster Flats”, a 6 apartment building. He’s still living on Arlington, but managing the apartment building as his main job. There is a story in the family that Edwin went bankrupt in 1912 and took his family to California for a time, to live with the Charles Frederick Koehler family, his father-in-law. While I believe that Edwin William went bankrupt in 1912, from several family statements. I see no historical evidence so far of the reported sojourn in California immediately following the bankruptcy. They were at 1534 Arlington Ave from 1903 to 1915. There was a typo in the address in 1912, but I don’t believe they moved to 1635 Arlington, I believe it was a typo. So, I believe, any visit to California was a short one. I just don’t find any evidence of them in California in city directories, census or newspaper records. If any of you Forster researchers find any hard evidence of the trip to California, I’d love to have it. From 1920 to 1940 and I presume until his death in 1941, he lived at 819 7th Street, in Apartment 1. Other family members, including my Grandfather Ruthven Robert Forster, also lived at that address at certain times.